If you’ve ever strolled along the Australian countryside, hiked up the continents’ snowcapped mountains, or meandered through Sydney’s tree-lined streets, you’ve probably happened upon the flowering trees and shrubs of the eucalyptus species. Mostly native to Australia, there are more than 700 different varieties. It’s been said that botanist David Nelson is credited for identifying and introducing eucalyptus to the world when he sailed with Captain Cook during his 1777 expedition. In the last few centuries, eucalyptus has been found in India, Europe, Indonesia, Unites States, and South Africa, and many other tropical and sub-tropical regions. Eucalyptus essential oil is extracted from the leaves of the evergreen eucalyptus trees (a.k.a. Eucalyptus Globulus). The oil gland covered leaves contain powerful natural disinfectants. As an antiseptic, Australian Aborigines have used eucalyptus leaves to disinfect wounds and treat infections for thousands of years. It’s also a great salve for insect bites and stings. 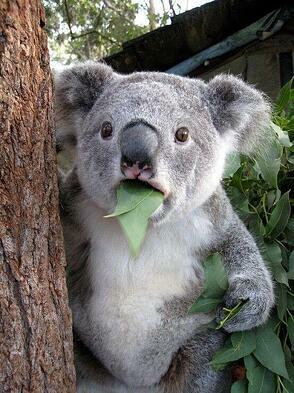 Although eucalyptus leaves are known to be toxic, there are a few leaf-eating animals who can tolerate the toxins – like koalas. The therapeutic properties of eucalyptus oil make it a powerful elixir. Its health benefits are extensive – including anti-inflammatory, antispasmodic, decongestant, deodorant, antiseptic, aromatherapy, and antibacterial. It’s no wonder eucalyptus oil is used in so many spas, and listed in the ingredients of inhalers, salves, vapor rubs, pain relievers, mouthwashes, mosquito repellents, and other over the counter products. Many spas use eucalyptus oil for its cooling and refreshing properties. They also add it to baths to ease sore muscles and joints, and increase circulation. At home? Just add some drops of Eucalyptus Oil to a hot bath. One of the greatest benefits of eucalyptus essential oil is its vapor. It’s commonly used in aromatherapy, saunas, and spa treatments because the fresh and earthy aroma is invigorating and energizing. As a stimulant, you can pair eucalyptus and peppermint oil in a diffuser. To scent the air, place a small cup of Eucalyptus Oil (it’s ready to use) in a steam room or sauna, or pour over a sauna stove. As a room freshener, add eucalyptus oil to a bowl of boiling water and place anywhere you want a fresh scent. You can also treat sinus infections and respiratory conditions with eucalyptus oil. If you’re looking to clear congestion, relieve sinus inflammation, and open blocked passages, just add eucalyptus oil to a large bowl. Drape a towel over your head and the container so steam won’t escape. Relax and breathe in deeply through your nose (your mouth should be closed). You can also put eucalyptus oil in a humidifier to help relieve respiratory difficulties. Since there are so many wonderful ways you can use Eucalyptus Oil, we hope you get a chance to try one (or two) of these and let us know how it works. Give us a shout out on Facebook, or email us at hello@zogics.com.